Gandhi Jayanti is held in India to celebrate the birthday of one of the greatest leaders of the nation. Popularly known as Gandhiji, he was the main pole for the Indian freedom struggle. He is famous all over the world to be the first leader who brought freedom to a nation through non-violent policies. India, all people celebrate Mahatma Gandhi's birthday in great gaiety. Political parties like Congress hold big rallies and meetings on the day. The prayer meetings would usually begin with the recital of Gandhiji's favorite devotional song, which is Raghupati Raghava Raja Ram. 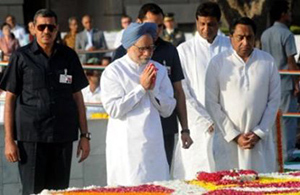 Flowers bouquets or garlands are placed the Mahatma Gandhi statues placed all over India. Some people hold parties on the occasion. You can use free online invitation tool, Yoovite.com for sending out invites for the party. 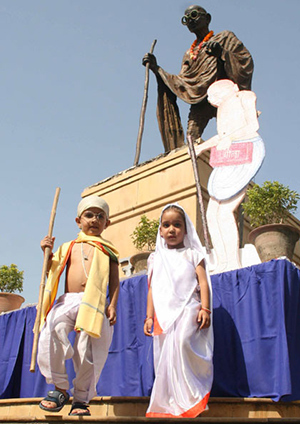 It is mostly schools that hold big events on Gandhi Jayanthi. All the government offices, post offices and banks will remain closed on Gandhi Jayanthi. Schools have meetings with competitions for kids. Painting, Elocution, Essay writing and Debates are the most common competitions for Gandhi Jayanthi celebrations in India. The themes for these competitions would mostly be something glorifying peace, non-violence and Gandhiji's efforts in Indian Freedom Struggle. Watching movies based on Gandhi's life is one the most loved indulgence of Indians on this day. Mahatma Gandhi is known among the greatest leaders in the world even today and his ideals are still cherished all over the world. The United Nations General Assembly declared 2nd October, the birth date of Mahatma Gandhi as ‘International Day of Non-Violence’ on 15th June, 2007.